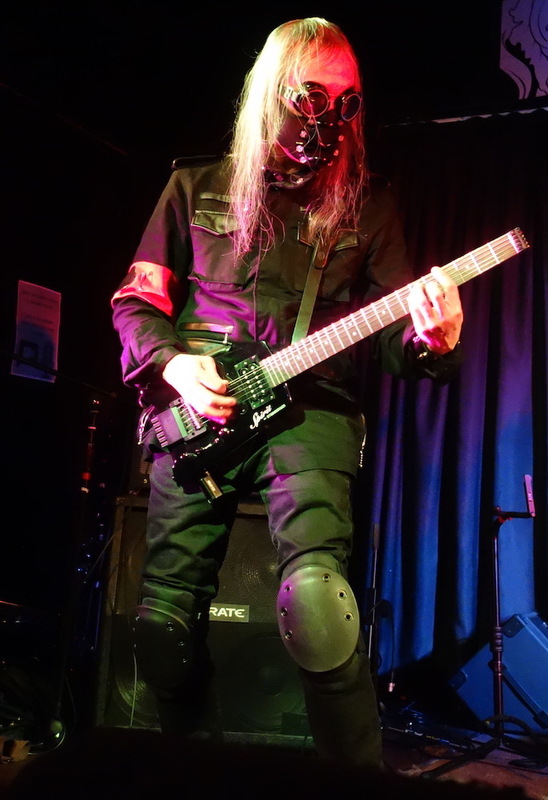 Hitting the UK in the spring months, Japanese cyberpunk outfit Psydoll took in an extensive number of venues across the country, including Glasgow, Newcastle upon Tyne, Edinburgh, Leeds and Birmingham. 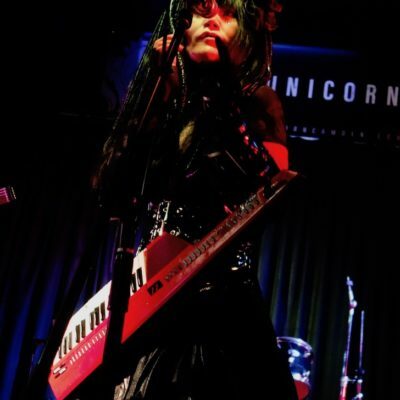 Consisting of Nekoi (vocal,keyboard,songs) and Ucchi (guitar,arrangements,computer works), Psydoll draw from a broad variety of influences, including obvious touchstones such as Blade Runner and Ghost In The Shell through to more esoteric concepts, such as Tarot cards and the world of the occult. 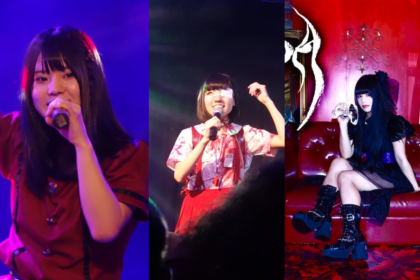 When their PSYDOLL in Delusion Tour 2019 hit London, J-Pop Go went along to see them in action where they were also joined by three other acts Angelbomb, Future Daughters and Azrael. 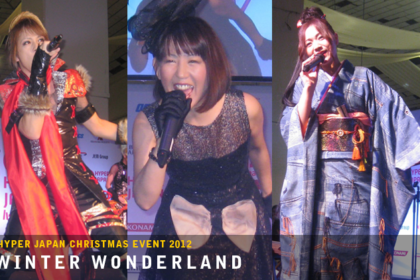 Psydoll recently released the fourth of a series of EPs gathered under the banner of Machine Kingdom (see J-Pop Go review previously). 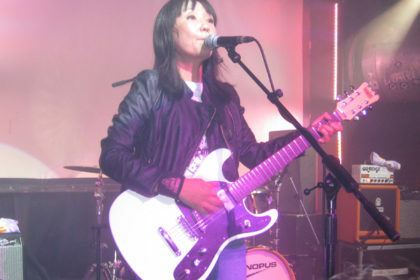 While having a sound that’s undeniably their own, you can detect hints of Polysics and underground occult idol outfit Necronomidol in the mix at times. 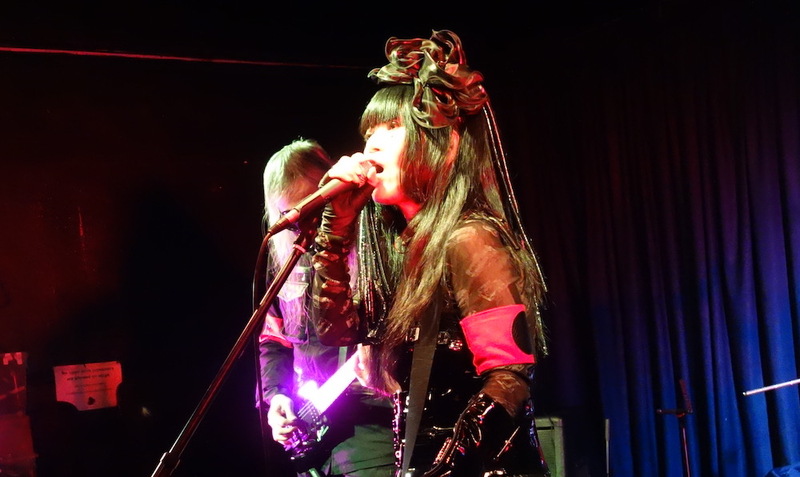 But the combination of Ucchi’s driving guitar sounds and Nekoi’s distinctive vocals present an outfit that has a particular energy on record – and which has decidedly more punch in a live environment. 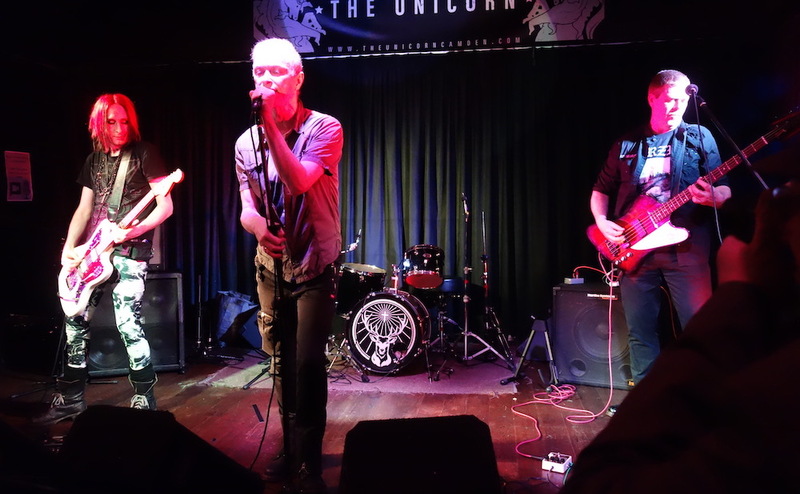 The venue of choice was The Unicorn in Camden, a location that’s best known for putting on heavier acts and assorted rock combos. Although not the largest venue in London, the stage is quite an impressive size and it’s several grades above many of the ‘spit and sawdust’ venues dotted around the capital city. 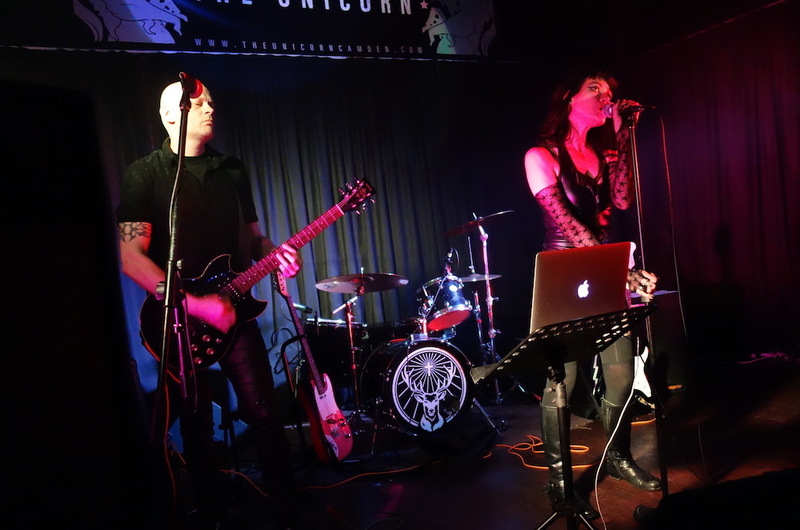 First up was Azrael, a duo formed from an earlier outfit called Riot In Paradise. 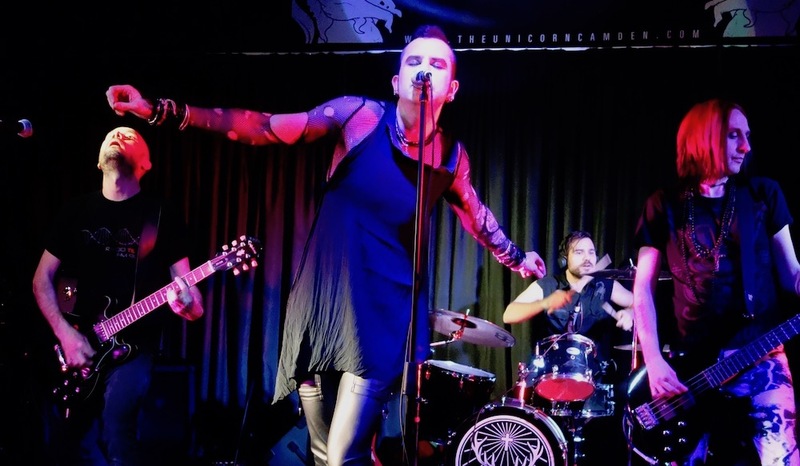 John and Michi keep their set buoyed up with some goth rock workouts. Michi’s voice has a quality that manages to be both understated and also quite powerful at the same time. Meanwhile, John’s guitar licks have a tight, muscular delivery. As an opening act, they served proceedings well, casting a suitably dark rock mood on things. Meanwhile, Future Daughters take to the stage with a larger line-up, augmenting their guitar and drums combo with some synth and electronic touches. 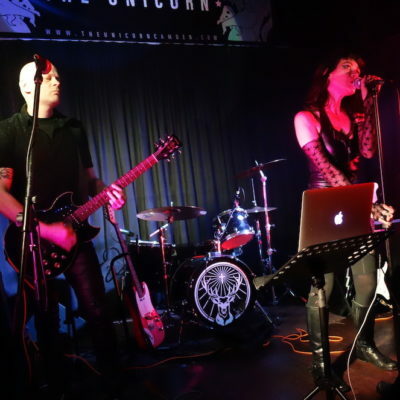 Their sound delves into that darker post-punk world typified by the likes of Bauhaus, The Mission and early Cure outings. There’s a real percussive kick to the material Future Daughters present, along with some swirly synths thrown in for good measure. 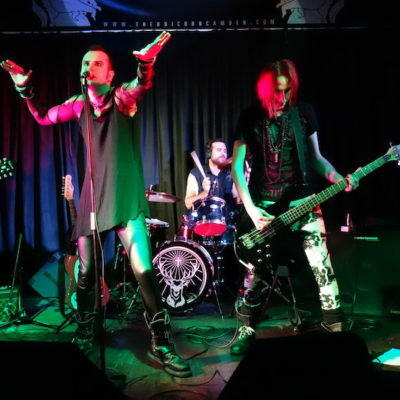 The result is a cosmic rock thrash-out that takes in the likes of the spacy ‘When It Breaks’; the punchier bass-heavy ‘Into The Light’ and the dark electro of ‘The Ratz’. All this and a brief and timely Prodigy tribute gets a good response from an enthusiastic audience. 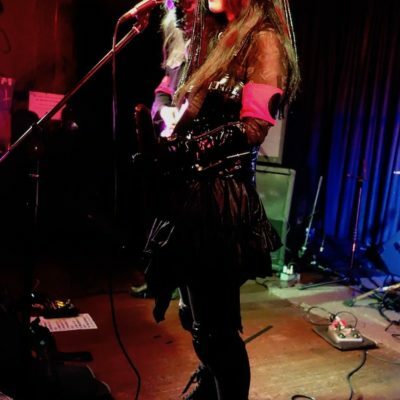 Rounding out the pre-Psydoll performances for the evening, London-based outfit Angelbomb put on a solid setlist of electronic-infused rock tunes. 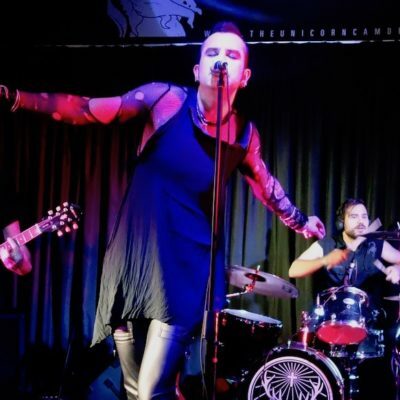 The band have been doing the rounds since the 1990s (although they took a lengthy break in 2002) and touch into the electro-industrial sound that brings to mind the likes of Front Line Assembly and Clock DVA. 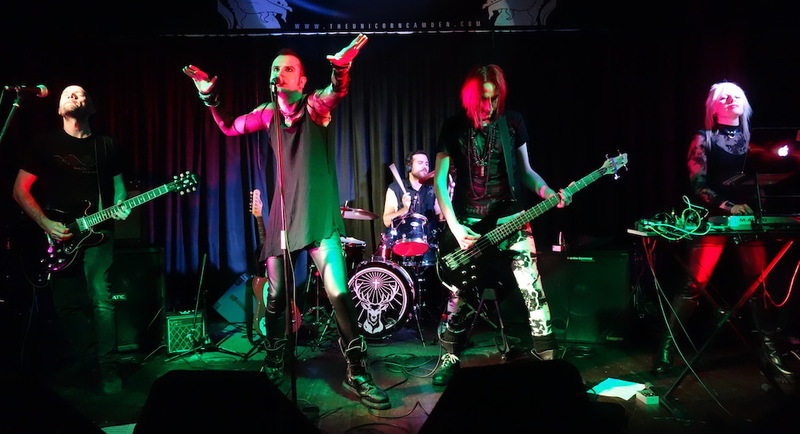 There’s a heavy quality to tunes such as ‘Walk Like Micky Rourke’ and ‘Bombed’, which rely on chugging guitars and a raw energy. Gareth Angel has the swagger and attitude to give the vocals a raw, visceral delivery. Meanwhile, Richard Ricochet (who is doing double-time tonight as a member of Future Daughters) offers some tight guitar work while Stef Cunningham provides bass duties. 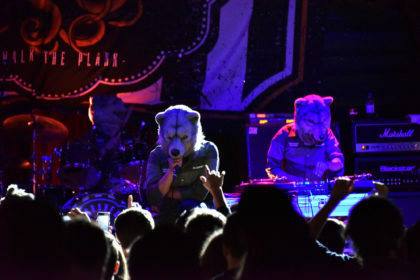 By the time Psydoll hit the stage, the venue appears packed out. Ucchi maintains an air of mystery hidden behind his face-obscuring mask. 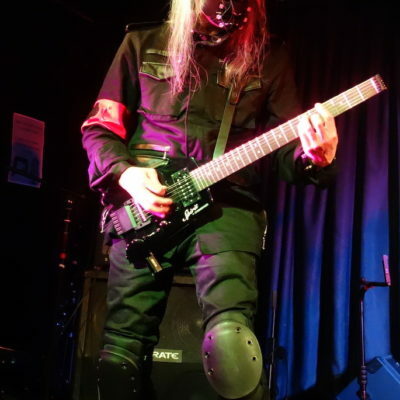 Looking like a figure emerging from a post-apocalyptic landscape, his guitar work establishes a weighty foundation for a concise workthrough of Psydoll gems. 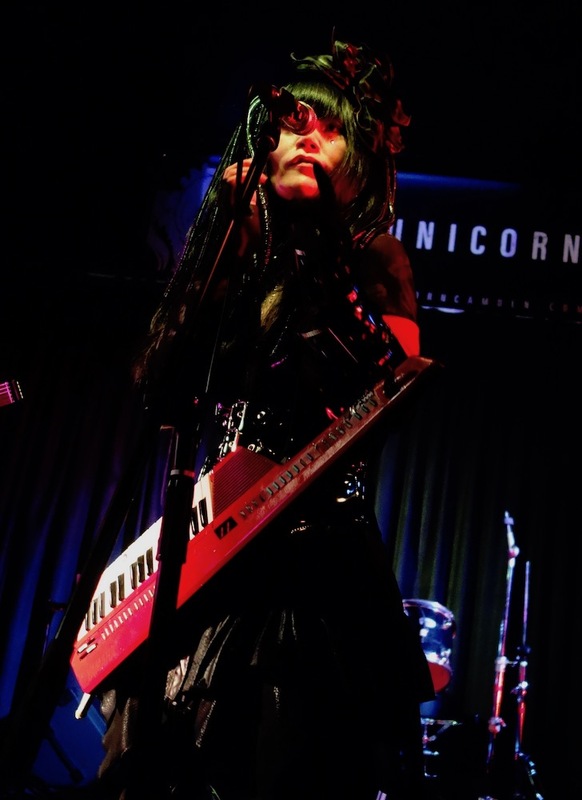 Meanwhile, Nekoi is all latex and leather with big hair as she prowls around the stage wielding her bright red keytar. Psydoll have recently released the fourth EP in their Machine Kingdom series. As a result, a lot of the setlist reflects tracks from those releases quite heavily. This includes a robust ‘Carnival’ (culled from Machine Disk, the third Machine Kingdom EP) which manages to strike a balance between energetic guitar work and Nekoi’s broad vocal range. Meanwhile, tracks from the Machine Cup EP offers a chance to showcase some of Psydoll’s more recent compositions. 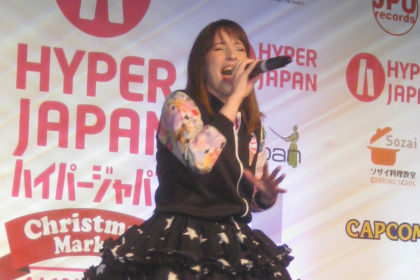 For instance, the strange, glitchy tones of ‘Little Ugly Mouse’ allow Nekoi to present a more fragile quality to her vocals. But it’s the mighty ‘Hector’ that arguably wins as the best song of the evening. The driving electronic rhythms and tight guitar work give this thumping tune a vitality that’s only matched by Nekoi’s clipped vocals. 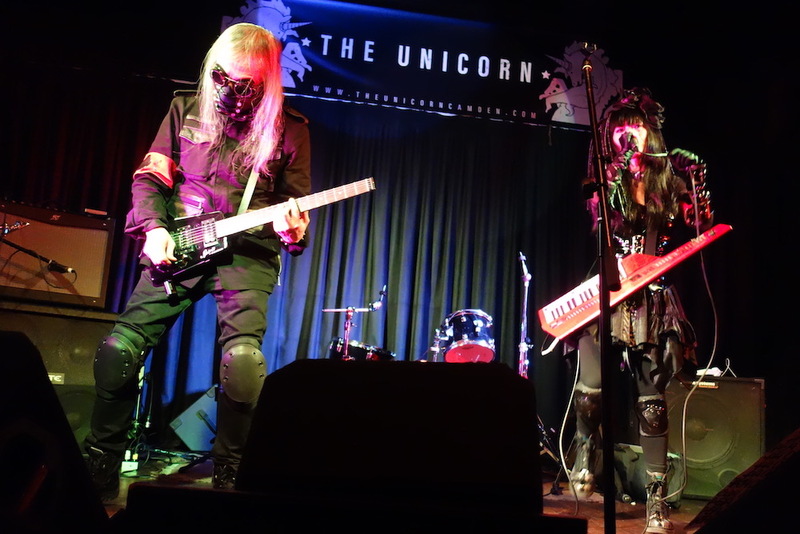 The cyberpunk duo close out the set with some fuzzy guitar goodness care of ‘My Birthday’, which seems to be a suitable song to finish things off (although such is the support from the crowd, that Psydoll get pulled back onstage for a spirited encore). 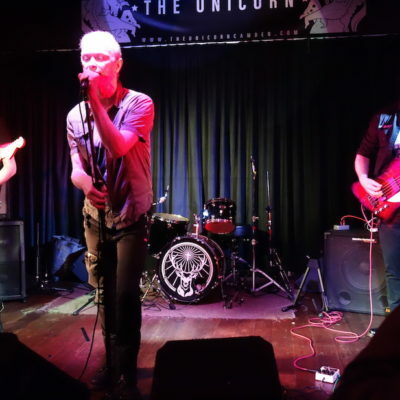 In many ways, the diverse acts gracing the stage at The Unicorn this evening are all very different in their sound and approach. At the same time, there’s a sense of chemistry that seems to give the evening a coherent theme of sorts. 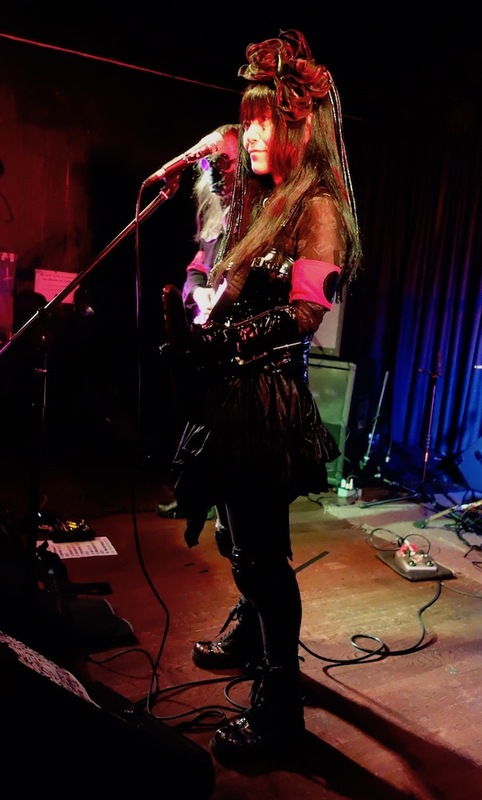 But for those keen to see one of Japan’s more unusual outfits, it was a perfect opportunity to catch some of Psydoll’s cyberpunk compositions live on stage. 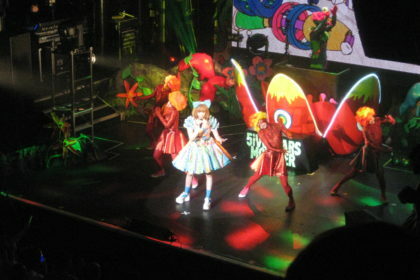 The duo promoted their UK tour with some suitably cryptic promotional work, flagging up their live shows with the statement that “PSYDOLL seems to exist. 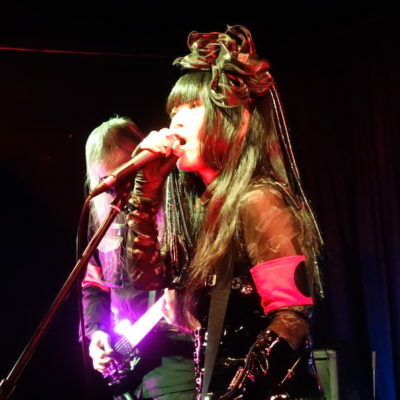 But- does that proof exist?”, but we can testify that not only do Psydoll exist, they’re also quite accomplished in delivering tunes.